We at the GTPG are happy to announce the availability of volume 1 of the Private Journals of William C. Brown, the godfather of microwave power transfer. This project has been in the making for several years, championed by Darel Preble of the Space Solar Power Institute and the Brown family. 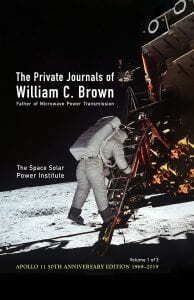 Proceeds of the sales go to the William C. Brown Fellowship at Georgia Tech, which supports superlative students at Georgia Tech who are making contributions to the field of wireless power transfer.